March 29, 2018, 8 a.m.
By John Saroff March 29, 2018, 8 a.m. 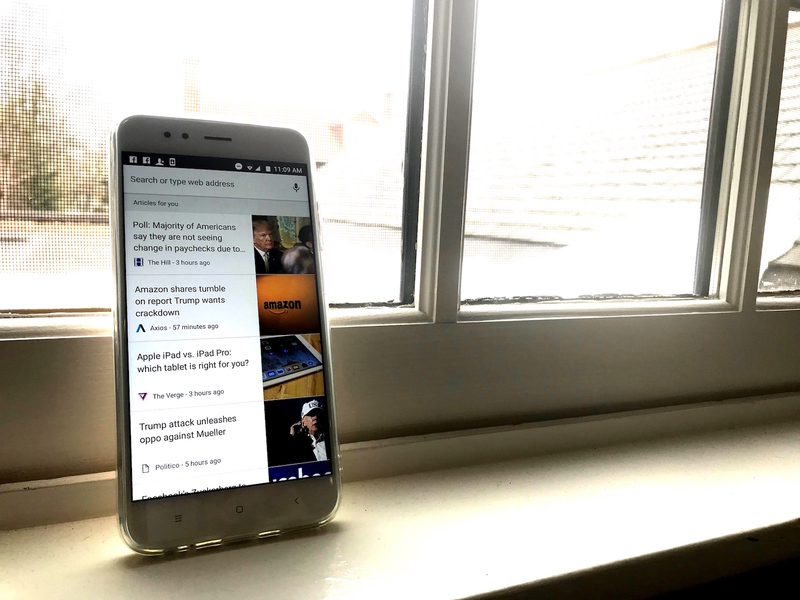 If you use Chrome on your phone or tablet, you’re probably familiar with the article suggestions that you see when you open a new tab in your browser. However, if you’re a publishing executive, you may not be thinking of them as a meaningful traffic source. Well, we have news for you: Research by Chartbeat’s data science team reveals that Google Chrome’s Articles for You (also known as “Chrome Content Suggestions” or “Chrome Suggestions”) is one of the fastest growing sources of publisher traffic on the internet. What does this mean for publishers? Google Chrome’s Articles for You is an under-publicized feature of Chrome on both Android and iOS that is now the fourth most prominent referrer in the Chartbeat network (behind Google Search, Facebook, and Twitter). Even though Chartbeat is currently only tracking Articles for You referrals from Android and not from iOS, its Android referrals alone are now about two-thirds the size of all of Twitter (desktop, Android, iOS) in terms of the volume of traffic sent. Articles for You traffic grew a shocking 2,100 percent in 2017 — from driving 15 million visits per month to publishers using Chartbeat to 341 million visits per month. Mobile traffic continues to grow as users transition away from desktop to mobile devices. Since January 2017, mobile web traffic to Chartbeat clients has grown over 20 percent, reflecting just how much more time users are spending on their mobile devices. Articles for You is also a default on the most popular browser in the world. Chrome users contribute 44 percent of the overall traffic to Chartbeat clients and 42 percent of the mobile traffic. A default on Chrome is a great place to capture user attention. Articles for You is on every single “new tab” page in each mobile Chrome Browser and accounts for roughly 12 percent of site visits on Android Chrome as per Chartbeat’s March data. Further, Articles for You surfaces predominantly AMP pages (72 percent are AMP), where visitors are 35 percent more engaged than on the standard mobile web. This speaks to the incredible power and influence that Google has over a user’s browsing behavior and, consequently, publisher traffic. Once a user has chosen Chrome as her browser, Articles for You is almost unavoidable. It is placed prominently within a user’s mobile experience, personalized with the immense knowledge that Google has about one’s browsing behavior and interests and frequently boosted by the speed of AMP. How does my browsing history affect what I see? If I read about Marine Le Pen on an American news site, will I suddenly start seeing more articles about Marine Le Pen, about right-wing European parties, from right-wing American sites? From French sites? Are all Google-crawled pages considered? Is it just a subset (perhaps the Google News corpus of whitelisted sites?). What factors (authenticity, reliability, pageload speed) drive a ranking? In short, how does Articles for You work? I would encourage Google to reveal some of these answers to the publisher ecosystem. When Articles for You was an insignificant source and a curiosity, this was not necessary. 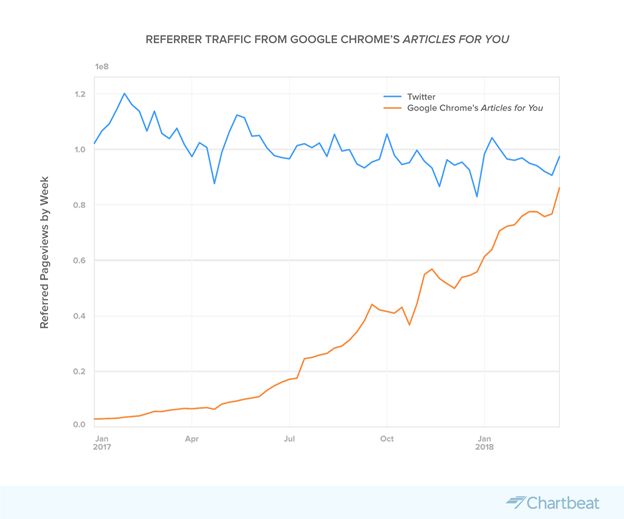 But now that it is meaningful as a referrer source to many publishers, it is in both Google’s and publishers’ interests to understand how to make sense of this traffic. Are these users a potential new source of brand loyalists? Or are they just fly-by users who boost short-term traffic, but don’t return or subscribe? More deeply understanding Articles for You is one of the next things on Chartbeat’s research agenda. John Saroff is CEO of Chartbeat. This piece originally ran at Digital Content Next. POSTED March 29, 2018, 8 a.m.
Saroff, John. "This is the next major traffic driver for publishers: Chrome’s mobile article recommendations, up 2,100 percent in one year." Nieman Journalism Lab. Nieman Foundation for Journalism at Harvard, 29 Mar. 2018. Web. 24 Apr. 2019. Saroff, John. "This is the next major traffic driver for publishers: Chrome’s mobile article recommendations, up 2,100 percent in one year." Nieman Journalism Lab. Last modified March 29, 2018. Accessed April 24, 2019. https://www.niemanlab.org/2018/03/this-is-the-next-major-traffic-driver-for-publishers-chromes-mobile-article-recommendations-up-2100-percent-in-one-year/.